On Sunday, 26 June 2016, 11 am to 6 pm, on the occasion of Bonn’s 20th Anniversary as Germany’s United Nations City, the Open Day “International Bonn” took place. They are some of the most famous buildings in the history of the Federal Republic of Germany: The Villa Hammerschmidt, the Official Residence of the Federal President in Bonn, and the former Federal Chancellery that today houses the primary seat of the Federal Ministry for Economic Cooperation and Development. On the occasion of Bonn’s 20th Anniversary as Germany’s United Nations City, the two buildings once again opened their doors and parks to visitors with an Open Day on Sunday, 26 June, from 11 am to 6 pm. The theme of the event was “International Bonn”. Federal Ministries, the United Nations and international organizations and companies all presented themselves and invited visitors to participate in various activities. BICC participated in this event by presenting the online-portal ‘Sicherheitspolitik.bpb.de’, which BICC has developed in co-operation with the Federal Agency for Civic Education (bpb). Everybody was cordially invited to test his or her knowledge of facts and figures about war and peace with a science quiz at BICC’s information stand! The specially set up stage offered an interesting blend of music and discussions. 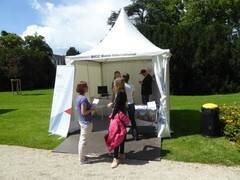 All information were available in both German and English to explicitly also appeal to Bonn’s international community. There were guided tours at the Villa Hammerschmidt, the Chancellor’s Bungalow and the Federal Ministry for Economic Cooperation and Development (former Federal Chancellery). The nearby World Conference Center Bonn also again opened its doors.